There’s no doubt Derek Sherinian appreciates his time in Dream Theater back in the ’90s. In the Dream Theater DVD “Score” Sherinian pretty much explains that, without his stint in Dream Theater, there’s no telling where he’d be musically – and certainly not making his own solo records. With his time in Dream Theater serving as a launching pad for his own musical success, Derek Sherinian has garnered praise and accolades for his consistent efforts and unique style. With “Blood of the Snake,” Sherinian follows the same model that guides his past solo efforts. Sherinian gets his musical colleagues together and creates a variety of tunes that allows everyone to shine. “Czar of Steel” leads things off as former DT bandmate John Petrucci lends his patented sounds and style to this heavy rocker. As you might expect, the Zakk Wylde led “Man With No Name” is groovy and heavy and has Wylde sounding more like Ozzy than he ever has. The surprisingly lithe “Phantom Shuffle” features a keyboard and sax dual that is refreshing in this guitar dominated age. “Been Here Before” features an impressive turn from Brad Gillis. The title track is a progressive neo-classical rocker that wouldn’t bee too out of place on the early Vinnie Moore and Tony MacAlpine efforts. “On the Moon” features Brad Gillis’ muscular tone and tungsten-tough riffs. “The Monsoon” is the second track to feature the heavyweight pairing of Zakk Wylde and Yngwie J. Malmsteen beginning with a ‘calm before the storm’ intro that makes way for dueling guitars in a torrent of notes. “Prelude to Battle” leads to Yngwie J. Malmsteen getting his glory in the spotlight on “Viking Massacre” with the typically aggressive shredding he is known for that soars and tears holes in the time/space continuum. The album ends with the relatively sedate and old-school rocking “In The Summertime” with Sherinian’s ol’ friend Billy Idol sounding happier than ever. At all turns “Blood of the Snake” finds Sherinian exercising restraint when necessary and exploding to the front as needed. Either way Sherinian expresses himself in a manner that allows his talent to shine through at all times – the fact that he has a number of his friends along for the ride only adds to the excitement. None of the tunes on “Blood of the Snake” have the epic length that gave “Black Utopia” its excessive progressive leanings. However, with a host of tunes that exceed the six minute mark I’m sure I’d find a couple of folks to argue about that with me. “Blood of the Snake” was produced by Derek Sherinian. Derek Sherinian is joined by John Petrucci, Tony Franklin, Simon Phillips, Zakk Wylde, Jerry Goodman, Brian Tichy, Brandon Fields, Jimmy Johnson, Brad Gillis, Yngwie J. Malmsteen, John “JD” Deservio, Dimitris Mahlis, Djvan Gasparyan, Mike Shapiro, Billy Idol, and Slash. For more information visit http://www.dereksherinian.com. "Black Utopia" is Derek Sherinian's third solo CD and the follow-up to "Inertia." Overall, I found "Black Utopia" to be a bit heavier than "Inertia" and that had me very excited. The trademark restraint and classic 'play within the song' vibe present on the "Inertia" CD is also present on "Black Utopia," but "Black Utopia" gets to rock out more than its predecessor. I must say that, aside from Derek Sherinian's work with Dream Theater and his own solo material, I've hardly heard him. I guess I didn't realize that Sherinian has played with Alice Cooper, Kiss, Buddy Miles, and Planet X not to mention Brad Gillis, Platypus, Jughead, and Pat Torpley. There's a lot of variety in those artists and it really shows in "Black Utopia." Just by having Yngwie J. Malmsteen on even one track meant that "Black Utopia" would have some crazed lead playing - and Yngwie delivers on "The Sons Of Anu." This seven-minute rocker is a classic epic tune with raging guitars, supple and versatile keyboard sounds, violin accents, and propulsive drumming. Zakk Wylde returns for his second set of appearances on Derek Sherinian's solo outings. Wylde lends his talents to three tracks and somehow manages to sound like himself without resorting to his trademark sounds. "Axis Of Evil" gets a Malmsteen/Wylde workout - this up-tempo rocker has been ringing in my head for days. Pure energy, pure joy, and pure virtuosity blend together to form a tension-wire rocker that seems twice as long as the six-minutes this track burns up. And that's a good thing. Even though "Black Utopia" may rock a bit harder than "Inertia" overall, there are still some magical mellow moments. Material like "Stony Days" features laid back grooves that captures off-the-cuff improvisational energy (Tony Franklin and Simon Phillips get co-writing credits), the world-music style of maestro Al DiMeola is featured on the short but eye-popping "Gypsy Moth," and "Sweet Lament" mourns its way through three-minutes of burning emotion. I enjoyed the cover songs Derek Sherinian chose for "Inertia," but he only gets one pick on "Black Utopia." Jan Hammer's "StarCycle," made famous by Jeff Beck, gets the royal rock treatment as Sherinian, Lukather, Franklin, and Phillips join together. The title track is the closing song and, boy, is it a doozy. At nearly nine-minutes "Black Utopia" is a journey of progressive music and hard rock wrapped up into one stunning package. I've not quite heard a track like this in a long time. The common thread in all of these tracks is the supremely talented Derek Sherinian. Given all of his work, especially the work he's done as a sideman with Alice Cooper and Dream Theater, it's easy to forget that Sherinian is a major talent. "Inertia" gave me some insight to his talents, but "Black Utopia" proves that Derek Sherinian is someone who'll be around for more than just a few years. Of course, any fan of instrumental music will find something to appreciate in Derek Sherinian's "Black Utopia." "Black Utopia" was produced by Derek Sherinian and co-produced by Simon Phillips. Derek Sherinian was joined by Yngwie J. Malmsteen on guitar, Brian Tichy on guitar, Al DiMeola on guitar, Jerry Goodman on violin, Billy Sheehan on bass, Tony Franklin on bass, Simon Phillips on drums, Zakk Wylde on guitar, Steve Lukather on guitar, and Mike Shapiro on percussion. First off, let's make it clear that "Inertia" is not a Planet X release. "Inertia" is solely the work of Derek Sherinian along with some very talented friends in creating a solid instrumental rock album. I found myself comparing "Inertia" to what Goldilocks might have said if she were looking for a CD: "not too progressive, not too heavy, not too mellow." Sherinian and friends strike the right balance between subtle tunes and rockers on "Inertia." The main guys in Sherinian's band are the versatile Steve Lukather on guitar and the underrated Tony Franklin on bass. Zakk Wylde, Tom Kennedy, and Jimmy Johnson make significant appearances on "Inertia" as well. No individual player hogs the spotlight for any great length of time; what's surprising is that Sherinian's keyboards are NOT front and center. Each musician works well within the context of the songs and the songs' arrangements. Sherinian does not dominate the recordings nor does he copy the progressive style of his former band Dream Theater. Sherinian works in tandem with his talented bandmates on every song. Sherinian's keyboard skills are most highly featured on songs like "La Pera Loca" and "Rhapsody In Black." The title track also displays a well-rounded rock'n'roll approach to the instrumental genre. As the title might suggest "Evel Knievel" is an up-tempo rocker; the tune features the explosive, high-energy six-string attack of Zakk Wylde. Wylde also plays guitarist on the ballad "What A Shame" where he shares the spotlight with Lukather and the classic rocker "Frankenstein" originally made famous by then Edgar Winter Band. The oft-covered "Goodbye Porkpie Hat," made famous by Jeff Beck, is also covered on "Inertia." 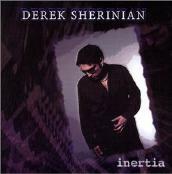 Fans of instrumental CDs would enjoy Derek Sherinian's "Inertia." "Inertia" was produced by Derek Sherinian and Simon Phillips. Derek Sherinian is joined by Steve Lukather (Toto) on guitar, Zakk Wylde (Black Label Society) on guitar, Tom Kennedy (Al DiMeola) on bass, Tony Franklin (Blue Murder, The Firm) on bass, Jimmy Johnson on bass, Simon Phillips (Jeff Beck, Asia) on drums, and Jerry Goodman on electric violin.